These posts deal with Bible prophecy and understanding the times we are living in. Prophecy makes up 1/3 of the Bible’s content and we have more fulfillment to come. These characteristics and actions will identify the antichrist during the tribulation. Is the rapture Biblical? Why will God rapture the Church before the tribulation? What comes before, during, and after the tribulation period? How can I understand Bible prophecy? These 5 tips will help. 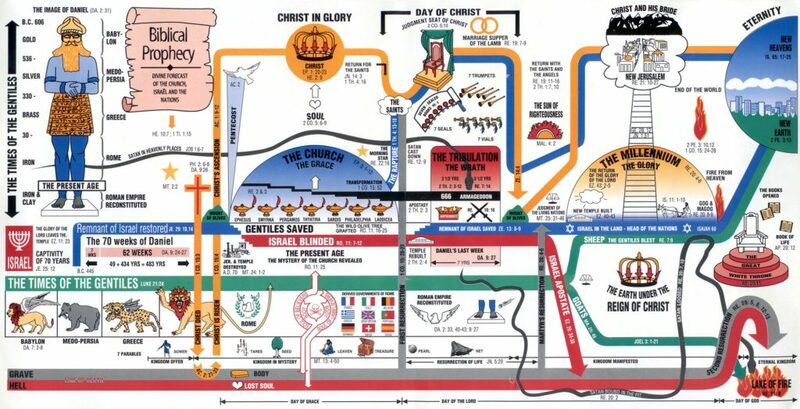 Here's the grand timeline of what's going on in the Bible. Will Christians be here or will we be gone? What will the Sons and Daughters of the Kingdom have to look forward to in the Millenium reign of Jesus and the New Heaven/Earth? What is happening to our world? Chaos, division, and hopelessness are everywhere. It seems that more people are not looking towards each other for help, but are looking up,..but not to God. We are living in the last days and we should understand prophecy as well. Does God use pagans as prophets? I believe that He does, and uses books, movies, music, TV and other forms of media to send His message through what has been known as "predictive programming".